Since last year and after the start of the data tariff war in the telecom industry, Bharti Airtel is trying to do business differently. The focus of the company has shifted to acquiring as many subscribers as possible, and as such, Bharti Airtel is leaving no stone unturned. New phone buyers are also a big win for the telcos as the buyers often tend to buy new SIMs with their phones, as such Bharti Airtel is capitalising on this behaviour with its online store. Buyers who purchase on Airtel Online Store do not only get perks like an easy EMI, but they also enjoy attractive benefits on the bundled plans which Airtel offers with its smartphone purchases. Here is all you need to know about Airtel Online Store and the latest arrivals there. Currently, Airtel Online Store is offering some of the latest phones available in the market which includes titles like Samsung Galaxy S10 and S10+, Apple iPhone XS Max, Apple iPhone XS, Apple XR and Samsung Galaxy Note 9. Even some other premium offerings like Nokia 8 Sirocco and Google Pixel 3 are available in EMI on Airtel Online Store. If you are interested in buying a premium smartphone with a bundled postpaid offering then you can head to the Airtel website airtel.in/onlinestore/ where you can choose your smartphone of choice. The buyers of the phone will then need to enter their number and verify the number by receiving an OTP. Next up, they will also be required to enter more details like PAN, Aadhar, name, email and other details. Further, smartphone buyers will also have to enter their bank details like account number and IFSC code. The bank details of the buyer will be required by the website to calculate the CIBIL score based on which you will be declared eligible for a phone loan or not. If your application is eligible, then you will be required to make the down payment for the device. The other EMI details about the phone, like the amount of monthly EMI, tenure will be displayed to the buyers. Like we mentioned above, the buyers of smartphones from Airtel Online Store won’t only enjoy attractive EMIs, but they will also be getting a bundled postpaid plan with their purchase which will avail them various benefits like unlimited calling, monthly mobile data, handset protection damage and one year of Amazon Prime at no additional cost. Although the data offering will be subjective to the price of the smartphone that you buy, the handset protection will only be available on devices with MRP of Rs 26,200 and above. For example, the Samsung Galaxy S10 128GB is available to the users at a down payment of Rs 9,099 and monthly Airtel plan of Rs 2,999 for 24 months. In this plan buyers will enjoy free Netflix for three months, Amazon Prime free for a year, 100GB data per month, free handset data protection and unlimited calling. 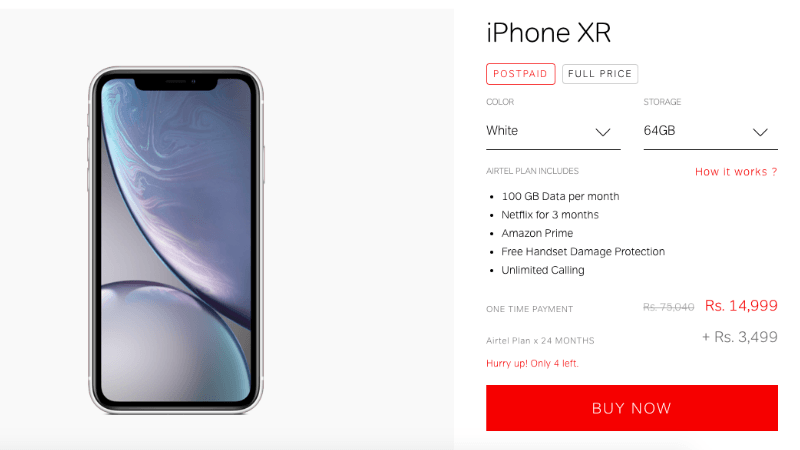 Similarly, another premium offering, iPhone XR is available for Rs 14,999 with 24 monthly instalments of Rs 3,499 which would fetch the buyers the same benefit as the Samsung Galaxy S10 postpaid plan.